October and November are the best month to visit Korea. The weather is sunny, cool and crisp, this is the best time to experience the beauty of Korea fall foliage. The peak fall foliage in Korea is mid-October but south part of Korea always start from late October until mid November. The fall foliage when leaves color change around 20%, and the peak when the color reaches 80%. 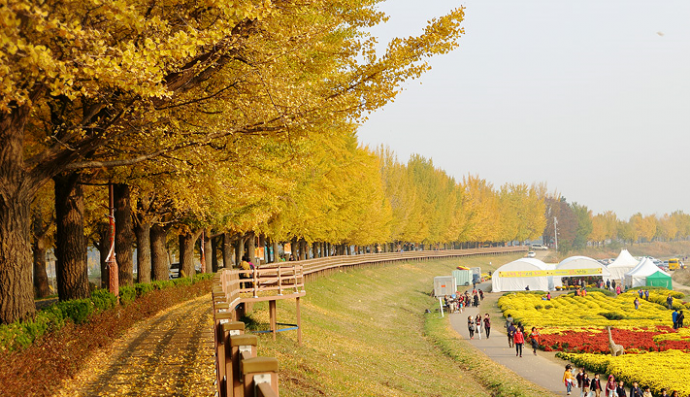 At the peak time, Ginkgo trees and maple trees throughout Korea change their hues to yellow and red. 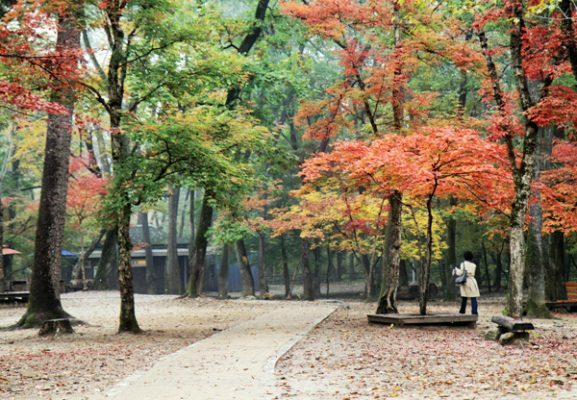 If you are already enjoyed the fall foliage in Seoul and some popular places such as Nami Island, Seoraksan Mountain and Naejangsan Mountain. This time you should explore something special. Let’s check out some beautiful secret places that are not many foreigners know. Hongcheon Ginkgo Forest which had been closed to the public from 1985 but allowing visitors enter again since 2010. 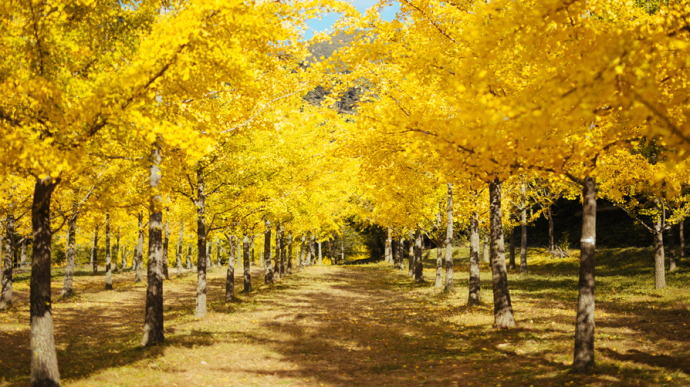 This forest is lined with over 2,000 ginkgo trees without any other tree species. The trees color turn into golden yellow from mid October. It takes about 2.5 hours from Seoul by car to Hongcheon Ginkgo Forest. Asan Gokgyo River Ginkgo Tree Road is a road lined with ginkgo trees which is next to a river, it takes about 2.5 hours from Seoul by car. The Ginkgo trees change their color to bright golden yellow from early November. 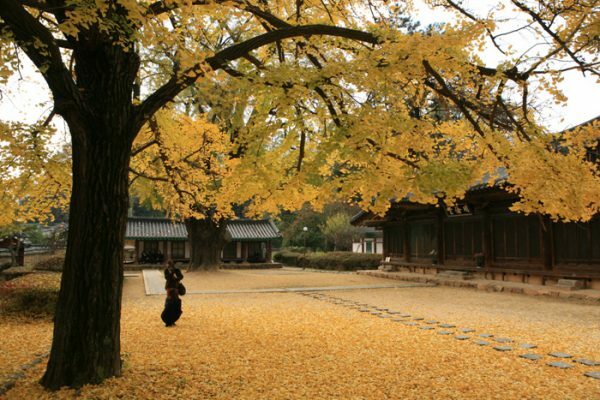 Some people say the Ginkgo leaves and seeds smell like dog poop but whatever it smells like, there are many Korean people visit this place because its beauty. Seonunsa temple is a head temple of the Jogye Order of Korean Buddhism, it is located on the slopes of Dosolsan Mountain of Gochang country. This temple was established by Seon Master Geomdan in 577, the temple name means the place where an ascetic devotee practicing seon meditation with the evening cloud with dwells in the blazing red of the setting sun. Spring, summer, fall and winter sceneries are beautiful as well. Peak time between second week to third week of November. 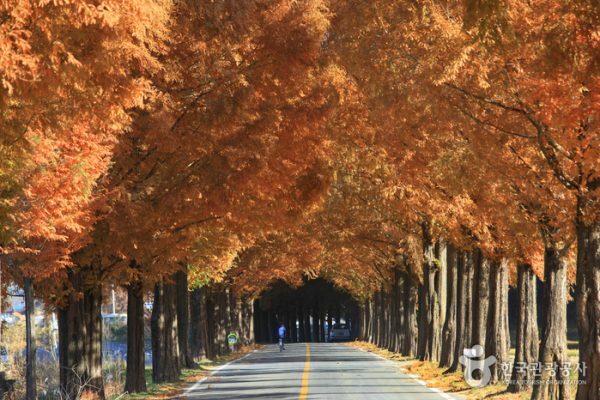 Located not far from the Damyang Bamboo Garden, the Metasequoia Road was selected as one of the most beautiful roads of Korea in 2006. 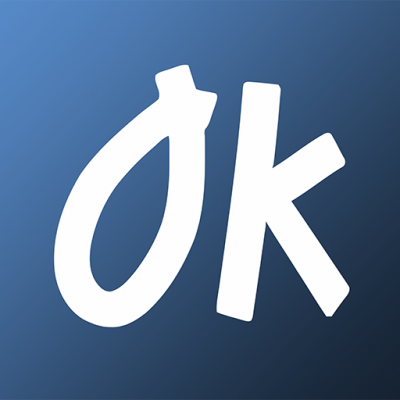 It has been featured in various Korean TV shows. Initially planted in 1970, the boulevard’s massive Metasequoia trees are now forming a large canopy above the road creating a beautiful scenery in every season and weather. On the Metasequoia Forest Road, electric two or four-wheelers and bikes are available for kids or families to enjoy a relaxing ride with the high trees fresh scent. Magoksa Temple was founded by Monk Jajangyulsa in 640, it is a representative temple of the Chungcheongnam-do Province. It is located on the slope of Taehwasan Mountain of Congju city. The name Magoksa originated with Ven. Bocheol Hwasang, a monk who lived there later, because the way many people gathered to listen to his Dharma talks reminded him of hemp stalks closely packed together. Visitors can see the peak fall foliage on early November. Korea National Arboretum is located in Gwangneung Forest, Pocheon-si of Gyeonggi-do. Gwangneung was a royal forest, which surrounding a mausoleum of King Sejo of Chosun dynasty. The Gwangneung arboretum was established in 1987. It became the Korea National Arboretum since 1999 and designated as a UNESCO biosphere reserve in June 2010. Korea National Arboretum covers an area of 1,157㏊ and contains 15 specialized plant gardens, forest museum, wildlife conservatory, forest zoo, her-barium and seed bank, White-bellied Woodpecker and 900 plant species, etc. Visit here to breathe the fresh air in deep forests. It only takes about one and half hour from Seoul, visitors could also visit the Art valley and Herb Island after visiting Korea National Arboretum. It is a school originally established at the Gyeonggijeon Shrine site in Jeonju city during the Joseon Dynasty (1392-1910). Gyeonggijeon Shrine and the Jeonju Hyanggyo were completely destroyed in 1592 due to the Second Japanese Invasion but the Jeonju Hyanggyo was moved to and rebuilt in 1603. In total, there are 99 rooms at the Jeonju Hyanggyo.It has become a shooting location of the Korean dramas ”Sungkyunkwan Scandal” and ”Moonlight drawn by clouds”. Check out our Jeonju Hanok Village Tour. 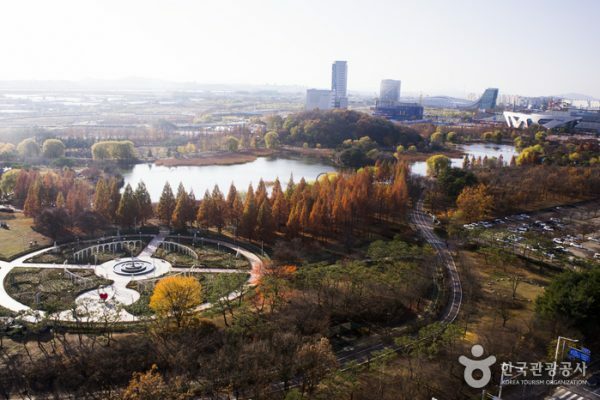 Spanning over 991.800 square meters, Ilsan Lake Park is the largest man-made park in Asia. The huge lake is surrounded by beautiful nature and offers a lot of activities to its visitors. The Riverside Square, artificial islands, a bike path, playgrounds, fountains, wild flowers and a dense forest. This is the perfect location for a family and couple!